In this continuing series by CyArk, we explore just a few of the world's most endangered heritage sites in several categories, separated by the general nature of the hazards they face. One of the most severe and looming threats to ancient heritage is posed by the byproducts of industrial contamination of the environment in which these sites endure. Acid rain, a byproduct of the large-scale burning of sulfates and nitrates, has been an observed phenomenon since the very earliest years of the industrial revolution in 1872, when English scientist Robert Angus Smith wrote of its corrosive effect on buildings and plants. As large amounts of these chemicals are released into the atmosphere through such processes as the burning of coal, they become bonded with water vapor held in clouds and are subsequently released to the Earth in the form of highly acidic rainfalls. While acid rain only causes indirect damage to living human beings, primarily through its reactions with Volatile Organic Compounds (VOCs) to form ground-level Ozone (smog), it causes tremendous damage to soil fertility, aquatic life, and durable inorganic materials such as stone and metals. Some of the greatest measurable effects of acid rain can be observed on human constructions, particularly old buildings with facades built of corrosion-prone metals such as copper and porous stone such as limestone. Unfortunately, buildings and monuments at most of the world's most important heritage places were not built to withstand such toxic punishment, and as many of these great sites are located in or near burgeoning industrial cities, they have sustained considerable damage. In our modern global economy, as developing countries such as China and India become increasingly industrialized without implementing the stringent pollution controls mostly adopted decades ago by older industrialized nations, many of their greatest cultural treasures are at risk from their own runaway national economic success. These hazards are not, however, limited in any sense to the rapidly-industrializing world; countries such as Australia have also experienced terrible conflicts between cultural preservation and industrial concerns, while the chemical-laden clouds themselves know no borders and have the potential to float over a large area. Towering above the sheer river gorges of China’s Sichuan province, Mount Emei, one of the “Four Sacred Buddhist Mountains of China”, represents the main seat of Chinese Buddhism. It is home to the country's first Buddhist temple, built in the 1st century C.E., and contains numerous other temples, monasteries and religious shrines, including the 8th century Leshan Giant Buddha. This Tang Dynasty-era masterpiece is the world's largest Buddhist statue, reaching an awe-inspiring 71 meters in height and is 28 meters in width. Carved out of a face of a sandstone cliff facing Mount Emei, the Leshan Giant Buddha is surrounded by spectacularly lush and breathtaking subtropical and subalpine forests, and rests atop the confluence of three major rivers, the Minjiang, Dadu, and Qingyi. This site is a place of invaluable religious, artistic and natural significance. 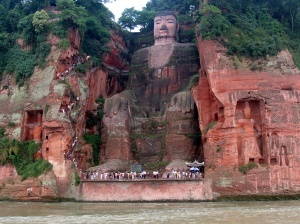 The Leshan Buddha has fallen victim to pollution emanating from unbridled development in the region. In this case, the culprit has been determined to be the growing number of coal fired power plants located near the Giant Buddha, specifically, the toxic gases that their smokestacks spew into the air; these eventually return to the earth as acid rain. Over time, the Buddha's nose has turned black and the curls of his hair have begun to fall from his head. The local government has shut down several factories and power plants in close proximity to the Leshan Giant Buddha, which has stopped the blackening of his face from soot; however, acid rain continues to compromise the structural integrity of this masterpiece. The Leshan Giant Buddha, which was designed carefully to survive millennia of floods and earthquakes, is now at high risk of rapid deterioration from the unbridled pace of industrial development in western China. While there are many Acropolises in Greece, it is the Acropolis of Athens that is, without question, the most quintessentially important monument that carries the name; indeed, when historians refer to simply “the Acropolis”, it is the one in Athens that is being referenced. Located atop a flat rock rising 150 meters above the city of Athens, its three hectares of standing monuments from the Classic Periclean period (460-430 BCE) include the Parthenon, the Propylea, and the Erechtheum, as well as a few earlier Mycenean edifices such as the Cyclopean Circuit Wall that helped to defend the Acropolis from numerous invasions over the centuries. As the foundational center for Golden Age Athens and its way of thought, the Parthenon is widely considered to be the crucible of democracy and Western culture as we know it. In recent decades, as Greece has experienced substantial economic expansion and development, pollutants and heavy vehicle emissions from the booming modern city of Athens have contributed to acid rain in the region. The monumental and sculptural stone of choice for the ancient Greeks, marble, is highly susceptible to heavy surface degradation from even low levels of acid rain. The Parthenon’s magnificent marble relief frieze panels, for instance, have been chemically transformed by acid rain into soft gypsum. As details are lost and the chemical transformation soaks deeper into the marble on these vital monuments, pieces of them have begun to crack and fall off, with structural collapse a possibility in the not-so-distant future. Further complicating the situation is the seismically-active nature of the region, as earthquakes would have a far greater effect on marble constructions that have slowly transformed into gypsum than with unaltered marble. Located in Agra, India, the Taj Majal is a huge mausoleum built between 1631 and 1648 in the Mughal architectural style, combining elements of Turkish, Indian, Persian, and Islamic design. Considered to be the penultimate masterpiece of Islamic architectural art in India, it was built by Shah Jahan for his wife Mumtaz Mahal, and both are interred in it in a simple crypt. The Taj Mahal is India’s preeminent tourist destination, attracting between two and four million visitors annually. In an effort to control the deleterious effects of pollution, tourist traffic is not allowed near the site, with most visitors riding in by electric bus from nearby carparks. This has not, however, slowed down the degradation of the Taj Mahal’s marble facades from acid rain generated from local foundries and an oil refinery. 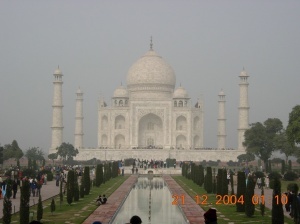 The once brilliant-white Taj has been losing its luster, dulling into a sickly pale shade. The Dampier Archipelago, located in northwestern Australia and stretching into the Indian Ocean from the Burrup Peninsula, is home to a magnificent collection of Aboriginal petroglyphs carved in rock faces and outcroppings. With around a million carvings across 400 square kilometers, these engravings constitute the largest corpus of rock art in the world. Some of the most ancient carvings date to tens of thousands of years into the past, when people first settled Australia, and depict sacred spirits, rituals, and animals – including several that are extinct (Tasmanian Tigers) or are no longer found in the region (Emus). The Burrup Peninsula’s rock art sites have been listed as endangered by the National Trust of Australia, but industrial expansion since 1963 across more than 25% of the rock art area has posed severe threats to the site. Much of the heaviest (mining and petrochemical) industry is located immediately adjacent to some of the most sensitive collections of artwork. Acid rain from this has begun to erase many of the carefully, but often shallowly, engraved rock surfaces, and studies by archaeologists and geologists have postulated that most of the rock art will disappear completely by the middle of the 21st century. The Longmen Grottoes are arguably the most famous ancient sculptural site in China. Located in Henan Province and positioned on two opposing bluffs above the Yi River, most of the artwork is Buddhist in nature and dates to the late Northern Wei and Tang Dynasties (316-907 AD). 2345 niches were carved from the rock, densely worked over the space of approximately a kilometer to the north and south, and they house more than 100,000 statues (also carved from the rock). Accompanying inscriptions bear more than 300,000 Chinese characters and are a treasure trove of historical and linguistic data. The Longmen Grottoes are a masterpiece of Buddhist art and are considered one of the world`s most important sculptural sites. 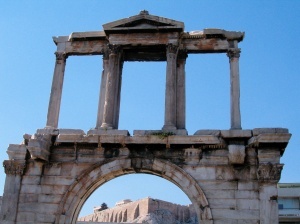 Through the centuries, natural and manmade factors have damaged the niches, sculptures and paintings. Crevices across the rock base are causing instability and have resulted in the collapse of some niches and the destruction of their contents. This process has been greatly accelerated by increased saline sediments resulting from acid rain, a major problem across much of China. Salt deposits have also built up in the niches themselves from slow permeation of acid rain into the rock, which then seeps into the niches through fissures in the rock, severely damaging and rapidly eroding many sculptures and paintings.